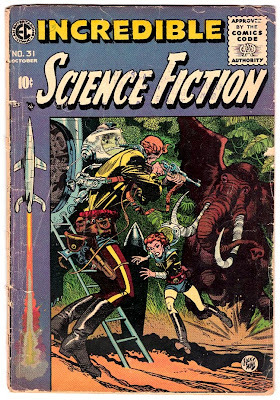 A classic from EC comics and artist Jack Davis. 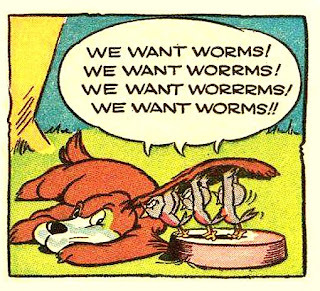 From 1955. Imagine life ten years from now. A man and wife take a vacation to Venus. The husband thinks that it would be the perfect time to finally get rid of his 'pain in the neck'. With one quick, clean shot. 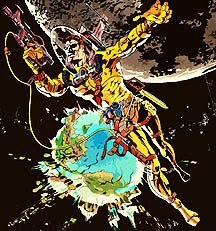 He climbs out of the spaceship and, as his wife is admiring the flora, he lifts his rifle and takes aim. Suddenly, out of the brush comes an enraged Venusian bull space-elephant ! Just in the nick of time, the wife leaps out of the way of the Venusian bull space-elephant, and the crosshairs of hubby's hunting rifle. 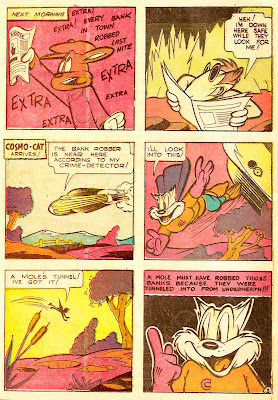 COSMO CAT DIGS UP THE MOLE - Plus, A BRAND NEW COMICS BLOG!! It seems that lately the neccessities of life have been stealing all my Blogging Time, and while I'd love to be able to post fascinating and entertaining comics each and every day, I have these things that keep coming to my house in the mail called bills. 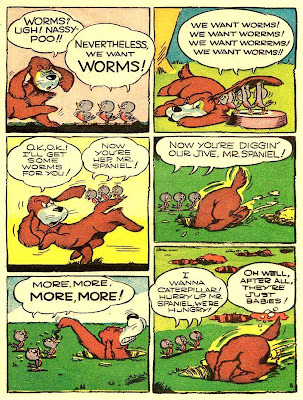 Now, if some of y'all can start helping me out with some of those, then I can spend more quality time posting those awesome comics you like so much! Do we have a deal? Actually, some of my fellow bloggers and fans got together and wrote me a little note. It said something like, "your blogs are awesome, and your posts are nice and juicy, but theres not enough of 'em. You need to be more committed." So I was thinking, and I...what? Sorry, what was that? Can you repeat that?...That's NOT what they said? Oh. really? I must have read it too fast...well, what DID they say?...they didn't say I should be more committed... they actually said I SHOULD BE COMMITTED! Oh, well, now that makes sense! I always knew my blog readers were the most perceptive blog readers! Thank you, all! I will endeavor to post more regularly, as soon as I get some help with those darn bills! Until then, won't you enjoy this wonderful little post I have for you? 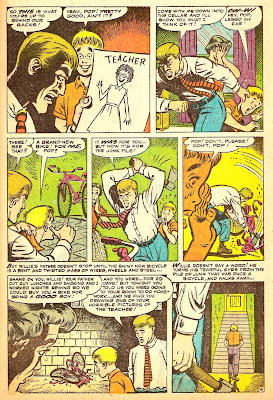 After you read this story, you can visit and bookmark the grandest,the brandest, most spanking new-est and awesome-est comics blog thats ever been released all day! That's right! 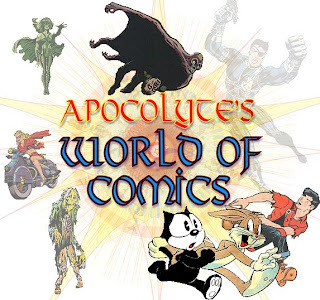 A new Apocolyte Comics blog! 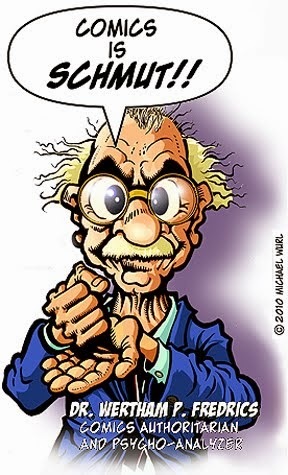 That means I'll have to start postin' regularly! Oboy! 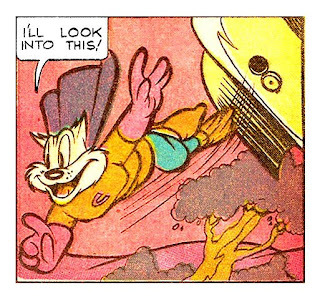 Because I love comics as much as you do, and because here at THE BLOG AT THE END OF TIME, I just can't handle all the comics I have to post, and because here at THE BLOG AT THE END OF TIME I may also occasionally talk about things besides comics (gasp!) 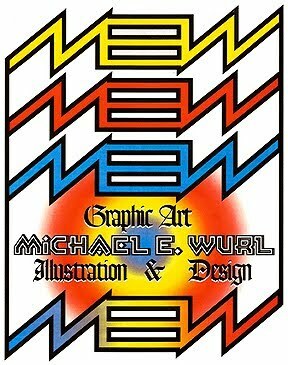 so I made a new blog JUST FOR COMICS! 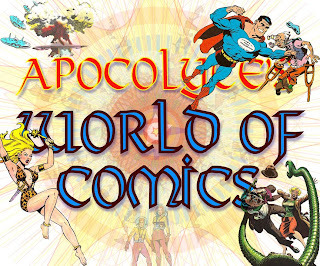 (NEW) APOCOLYTE'S WORLD OF COMICS - Comics, comics, and more comics! 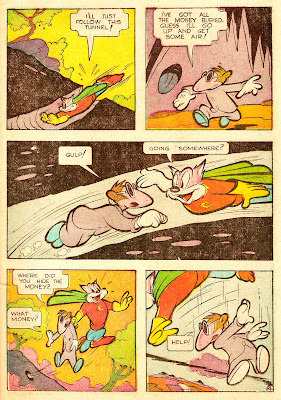 Now, enjoy this tale from COSMO CAT #3, 1946 from Fox Comics. 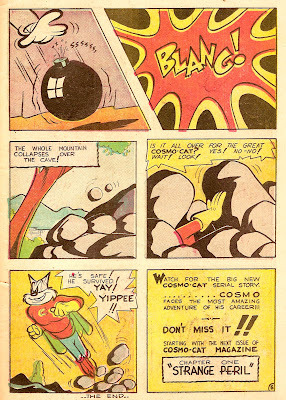 To learn more about Cosmo Cat, see the post(s) here and here at APOCOLYTE'S WORLD OF COMICS, as well as at Pappy's Golden Age Comics Blogzine here. 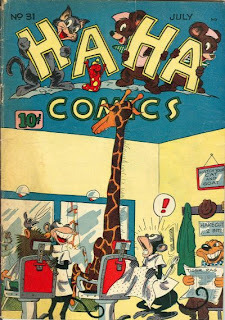 Now, won't you head over and check out my new comics blog? I think you'll like it. World War Two had finally ended, and it was okay to laugh again. Soldiers were returning home, the 'baby boom' was about to go BOOM, baby! 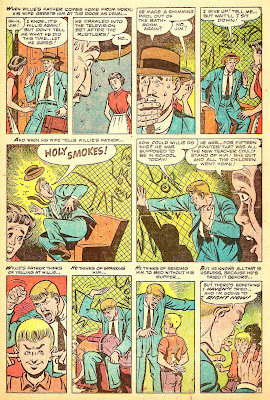 America needed a good Giggle or Haha, which incidentally were the names of two comics produced by ACG at that time. 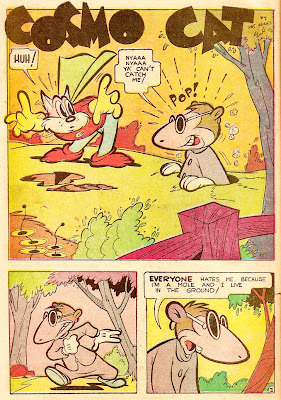 Today's story originally appeared in HA HA COMICS #31, 1946. 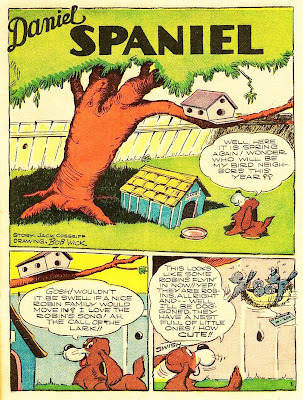 It's a cute little story about a happy little dog named Daniel (the Spaniel) and what he encounters when a family of Robins move into the tree in his yard. 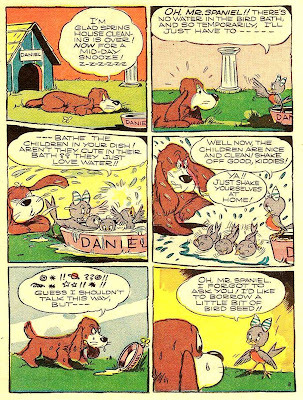 DANIEL THE SPANIEL was written by Jack Cosgriff and drawn by Bob Wick (Wickersham), two names that are probably better known in the field of animation. 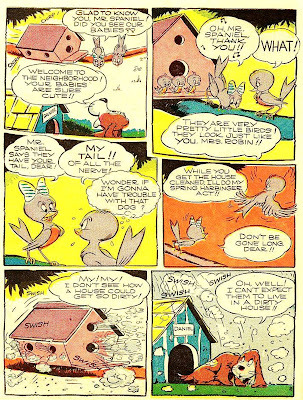 Cosgriff had written for the very first Woody Woodpecker cartoon, as well as The Fox and The Crow short, 'Woodsman, Spare That Tree!' that was directed by his buddy, Bob Wickersham. 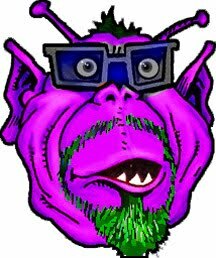 You can find more about Cosgriff here, and some good information on Wickersham here, here, and especially here. 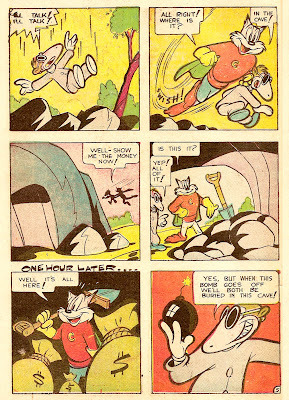 It makes sense in retrospect that animators would excel in the field of comic books. Here, both the story and the art work together to create the distinct personalities of each character. 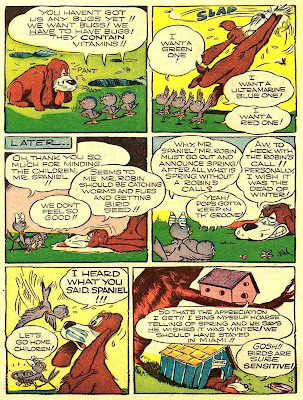 As of this posting, according to GCD this was the first comic book art for Wickersham (of course GCD's records are far from complete). 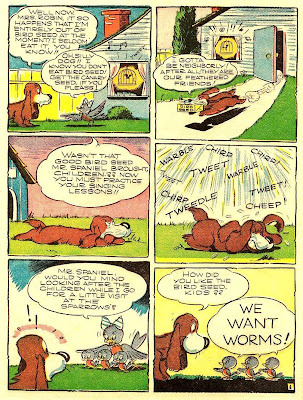 I will be looking out for more stories by Bob Wick and company. 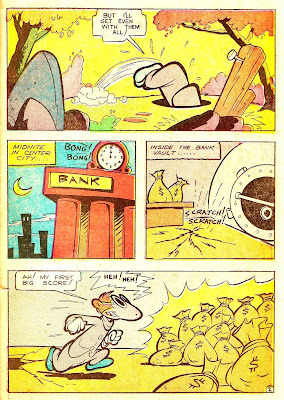 After the comic is another special treat just for you! 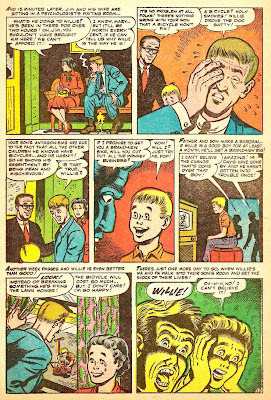 But you have to read the comic first! Here is "WOODSMAN, SPARE THAT TREE"
This is my first post of the new year. ...or none of the above. You fill in the blanks. All I can tell you is, time travel is possible, but the 'jet lag' is murder! Anyway, I guess all that matters is -- I'm back, and I brought something with me. 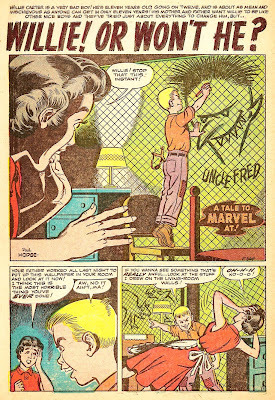 From MARVEL TALES # 130, January 1955 (Atlas) comes a light little story about little Willie, and his exhasperated parents. 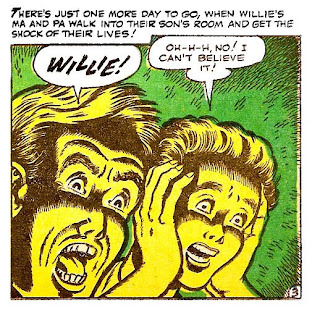 Willie has a habit of drawing, and...well, you'll see. I think they all might need a shrink! 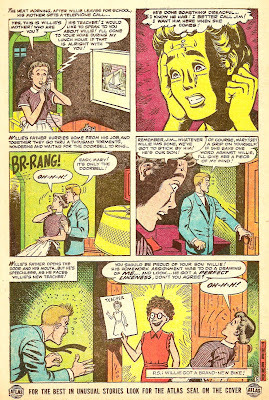 While the writer's identity remains unknown, this one was clearly drawn for laughs in an enjoyable style by artist Paul Hodge. Enjoy, see ya soon!